Harrison Ford had a smaller trailer, Chewbacca 'had some work done' and the J.J. in J.J. Abrams stands for Jar Jar Binks? In case you didn't know, Twitter is hosting a live Q&A event with some of the cast from the new Star Wars: The Force Awakens film. Carrie Fisher, Harrison Ford, director J.J. Abrams, John Boyega, Daisey Ridley, Oscar Isaac and Gwendoline Christie have all got involved. But while there hash't been any big spoilers revealed, some fun answers have popped up, including Harrison Ford admitting he had a "much smaller trailer" this time around when asked the differences in experience from being on the old set in the 1970s and now. Also, if you were wondering, why Chewbacca still hasn't gone grey while Ford has, Ford tweeted, "Yes! He's had some work done." Meanwhile, for Carrie Fisher, the most annoying thing about her character Princess Leia is her hair, and she also learned from her character that it's fun to yell at guys. John Boyega thinks Finn will "always" shoot first, because "Solo taught me well!" while Gwendoline Christie describes Captain Phasma (in one word) as "Shiney!" When asked who was the biggest fan of BB-8, Christie revealed, "Oscar Issac would scream every time he saw BB-8!" And apparently, John Boyega took Harrison Ford's golf buggy for a ride while Ford was working in front of the camera. The best for us, though, is Mark Hamill's question, "Hey J.J. can you clear up a rumor for me? Does J.J. actually stand for Jar Jar?" Abrams actually replied, tweeting: "Yes, Mark. Where have you been?! - J.J. Abrams." But of course, when responding to anything directly to do with the plot, the cast kept pretty tight-lipped. Responding to a question how much of an impact Captain Phasma has on the plot, Christie threatened, "If I were to tell you this then I would have to kill you"
Still, producer Kathleen Kennedy was on hand to reassure fans worried the new Star Wars films would just be a reboot, rather than a continuation of the series, tweeting, "No, there's a retro aspect, but everything is in service to new stories and characters." However, Osaar Isaac did confirm his character Poe will be "Bringing humor to the galaxy." You might be drawing Han Solo comparisons, what with Poe claiming he's the best pilot in the galaxy, and apparently, Isaac believes Poe's a better pilot than Solo as well. 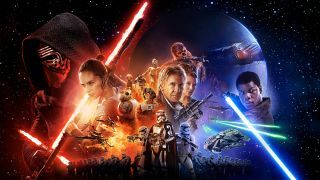 Star Wars: The Force Awakens hits cinemas worldwide on December 18 (December 17 in the UK and Australia).